Tonight, as the US sets off fireworks in celebration of Independence Day, balearic clubbers will flock to a different sort of revelry: Eric Prydz at Hï Ibiza. July 4 marks the third date of the Prydz’s summer residency in the White Isle, wherein he has thus far challenged the notion of what a club show can – and, perhaps, should – be. Those who follow the Swedish artist have likely seen the visual spectacle of his Hï performance series. Anchored by a majestic, monolithic bespoke installation, Prydz’s Ibiza run comes about as close to rivaling the pomp of EPIC’s intricate production as a club show realistically can. 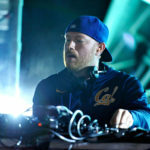 On the most recent EPIC Radio, Eric Prydz let his global following bear witness to the music of his residency, broadcasting an hour of his club show. Rightfully veering in a more balearic direction than the typical trajectory of his Beats 1 program, Prydz plays a plethora of unreleased, unidentified tracks alongside singles from Enrico Sanguilano, Layton Giordani, Fiol Lasse, and a wealth of cuts from his Pryda alias. Featured image by Robert Castano.